So Eldar are next. Looking on the net over the weekend the first pictures have emerged. I like the new cover - having been part of a Seer Village in the past - it looks sufficiently eldritch. However I do not like the new Wraithknight model. It seriously looks like it has been on the wrong side of an Orc Lucky Shrunken Head spell. Does My Head Look Small in This? Can't help thinking that on the fridge in the GW Design Studio cafeteria there is a set of word association magnets. We saw it with Fantasy....."Slaughter" "Brute" - I know "Slaughterbrute".....and now with "Wraith" and "Knight". Will we get some sort of mis-mash of "Fire" "Guard" "Swooping" "Spears"? The Nemesis sorry Wraithknight looks like he is also shitting sparkles everywhere. What's te point of it? They already have walkers I just don't see (judging by it's armament alone) that the knight will actually be adding anything other than excuse to sell another new giant kit. 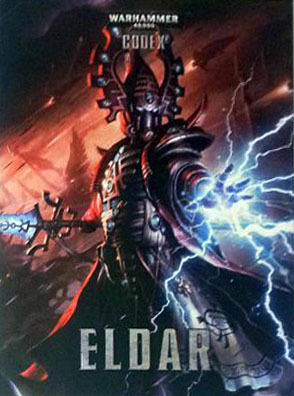 Not thats theres anything wrong with that ;) I am just curious as to what its niche within the niche of the specialist army of Eldar is?? 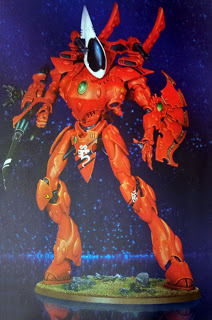 It really looks like the Tau have sold their technological secrets to the Ch... Eldar. But seriously, this is boding well for all Space Marine players everywhere - imagine the amazing gargantuan walker they will release the next time the Codex is updated (Spaceknight? Dreadknight? Spacelord? Spacenought? RipMarine? SpaceTide? Spaceturd?). Am hoping for a Land Raider-esque walker with about 6 HP and -2 to all penetrating results... and a jump pack. And perhaps some free tusk upgrades* as opposed to having to pay for them. I don't mind the head so much, doesn't suffer from extreme Riptide esqe shrunken head syndrome. The shield codpiece is an.. interesting choice. The Matt Ward naming spam seems to be spreading to even good writers. A 'Knight' isn't really a word or concept I associated to close with the Eldar asthetic. What really amuses me, in the wrong way, is the description about the pilot inside weeping over his twin. Guessing fluff wise will have to be a twin of the spirit stone piloting it (why>?? Just want to be like Avatar maybe? ), but some crying dude in a big walker doesn't inspire awe or reverance like a model this size should. Also where is the baby carrier on the front? Eldar Knight Titans have existed for a while, this is just the bringing of this class into 40k.